When it goes well, working with your WSF saves you money, benefits your WSF, and strengthens your friendship. When it goes badly, I have seen bad sites, behind-the-time sites, and sites that never get completed – to say nothing of hard feelings and shattered friendships. Despite this, I do a few WSF projects a year. Last year, I did one for a friend starting up a new business revivifying a craft emporium, and one for an acquaintance doing wonderful work in the circus arts. 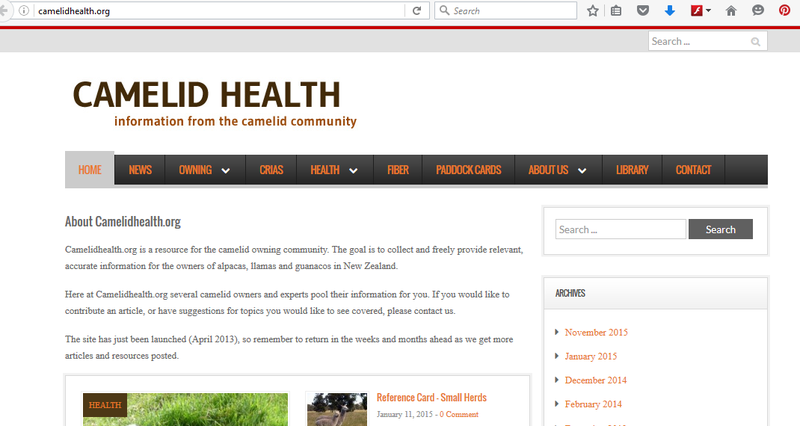 This year, I’ve completed one for a farmer interested in camelid health information, http://www.camelidhealth.org. These have all been excellent experiences – my friends were all good clients, and it’s been a pleasure to help intelligent, ambitious people get the recognition they deserve. Sometimes it’s been rockier. So, from my experience and that of other web developers I know, here is advice for potential clients on working with your web-savvy friend for a web presence. Is your project suitable for your WSF? Normally, WSF projects tend to be sites for small businesses, serious hobbyists, or not-for-profit ventures. Can you afford your WSF? Some WSFs will work for barter or negotiate on rates, especially if they are helping you after hours, or building a web portfolio. Others, who do web development full time, can’t afford to. If you want the web expertise of someone you know but can’t afford, it may be worthwile to pay them for one or two web building blocks, to get yourself started: a one-hour review of how web sites work, a WordPress tutorial, or web site header graphics. Have some example web sites in mind. Your successful rival, your inspiration, sites that look attractive to you, sites that you feel present information well. Choose your WSF wisely; you are going to be working with them for years. As part of this, avoid relatives. Most times, when I hear about an WSF project that’s gone seriously sour, someone involved was related to the WSF. Work with your WSF to draft a project agreement. This should include a project timeline, what is required from both sides, and the compensation for the WSF. I recommend a clause for compensation if the project stays at X level, and an agreed-upon standard for compensation if the project expands. Both sides can sign the agreement, or even (in New Zealand) say “OK” via e-mail. Work with your WSF to create the project timeline and deadline for your web site. A reasonable timeline for creating a small business web site with your WSF, if your WSF is helping you out after hours, is one to two months. Do NOT expect your WSF to also create your business plan. You need to understand your own field. You need to know who your online audience is, how they’ll be reading you, and what your goals are for the site. Read this article – Friendor pros and cons: What I learned from getting our photos for free. A great piece about the pros and cons of working with a skilled friend. Your WSF is going to tell you technical things. Listen to them until you understand them. There are plenty of people out there who will take your web money and cultivate your web ignorance behind the smoke and mirrors of it being too hard to explain. You can ask your WSF to explain twice; you can get it in writing. Provide photos and graphics, or support your WSF’s efforts to obtain/create them. I have found that client-provided photos and graphics are consistently the biggest hold-up in creating web sites of all kinds. Reply to emails from your WSF. Your WSF will email you information – sample graphics, hosting pricing plans, test versions of the site. You need to reply to these emails. It doesn’t matter if it was sunny, you were tired, or the dog had to go to the vet – you need to reply. If you communicated badly with a developer who wasn’t your WSF, you’d be charged for extra time, or fired as a client. Respect your WSF’s limitations. Your WSF may say something like, “I don’t do e-commerce,” “Graphic design isn’t my strong point,” “I can’t customize PHP.” This is not your WSF saying they don’t like you or won’t help you. They are giving you fair warning. Pressuring them won’t magically get you wonderful logos or fully implemented e-commerce. What they may be able to do is help you spend money on “the next level” intelligently. Get your site’s information from your WSF, and keep them updated on any changes. You ought to have information about the site host, your URL provider, all user names and log ins, information about accessing your site files via FTP. If you are maintaining the site yourself, you should also have instructions or a training session from your WSF. If you change any passwords, and you want your WSF to change or maintain your site, let them know. Compensate your WSF promptly. This is where WSF arrangements often fall apart – and it’s not the WSF’s fault. Friends, when you are in the client seat, you know what to do: deliver on compensation. Recommend your WSF. Give them positive notes on LinkedIn or recommend them for other web work. If you want to update your site yourself, start doing this ASAP. This benefits you – after all, you are the one who needed the site – and it benefits your WSF, because they get an example that they can show other potential clients. I dislike it when, as the WSF, I do a site for someone and it just…sits there. If your site is a business, take ownership of your Google business presence ASAP as well. Managing a Google business presence when you aren’t the main contact person for the business is time-consuming and disagreeable. Last year, I was approached by the couple behind the successful New Zealand alpaca breeders, Alpacas Rampant. They had created their own excellent web site for their alpacas, but, as their alpaca herd grew, they had less time for their own web work. They had a new web site that they wanted to do, a project to share information about alpaca and llama health. Would I be able to help them out as a web-savvy friend? I said yes with confidence. Before we even began, we talked about their hosting for their other site and blogs, and their URL preferences. We spent two weeks consolidating their hosting and URL registration from several sources with one carefully chosen service provider. The service provider had affordable hosting for multiple sites, and did not include any draconian statements about copyright or information ownership in their Terms of Service. The resulting cost savings helped them support the new site easily. I made sure that they were listed as the owners of their hosting and URLs, something I always do on WSF projects. This involves some back and forth, but it ensures that the clients are responsible for their hosting and URL ownership, even if they change who is helping manage their sites. We talked about their goals and ideas for the new site. The core concept was that the site would distribute knowledge about camelid health, like an online journal or magazine. They wanted a professional feel, something with medical or veterinary cleanness to it. Their anticipated audience would often be accessing the web through restricted rural connections. Some of them would have the newest mobile technology – and a lot of them would still have slow desktop computers. The site had to be fast-loading for all members of this audience. I encouraged them to add visual appeal with lots of images. We reviewed other sites in the field, many of which had not had their format updated for some time. To make it easy to maintain and add new content, and because strong security was not a #1 priority, we went with a WordPress system. I customized the theme with warmer colors to link it to the world of farming and camelids. We also discussed the best way to post articles and information sheets. For the time being, we created formatted PDFs linked to each post, with extracts. The posts are organized based on topics and health terminology. To get started, we used some graphics and photographs that were available under Creative Commons copyright, always using them with correct citations. The site owners are now using their own images. The final site is clean, professional, and “responsive,” which means that it will display well on all types of devices, from laptops and tablets to iPhones. The site owners are still my friends, and, after one or two queries, they are maintaining the web site and adding to it regularly. It’s already getting good traffic, and both positive and angry feedback from readers – success!